The goal of the Program is to collect the amount of the loss as quickly as possible for the person or business that has been the victim of fraud. All reasonable efforts will be made to obtain payment before filing criminal charges. Losses can be recovered in less time if payment is made without the need to file charges. If criminal charges are filed, additional time will be involved in the court process. The District attorney will prosecute the case to hold the person who passed the bad check accountable for their actions and so that they will be court ordered to repay the amount of the loss. There is no fee or cost to you as the recipient of a bad check to participate in the District Attorney’s Check Fraud Program. STEP 1: Re-submit NSF Checks. 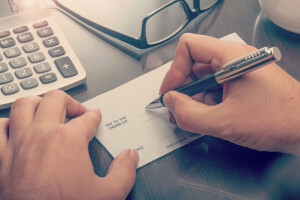 If the check has been returned from the bank and stamped “Non-Sufficient Funds” or “NSF,” you must re-submit the check to the bank for payment. If the check has been returned from the bank and stamped “Account Closed,” you do not need to submit the bad check a second time. STEP 2: Send Certified Demand Letter. Try to contact the person who wrote or gave you the check. If you are unable to contact the person, or they do not pay the check within a reasonable time, a demand letter must be sent by certified mail. A sample Demand Letter can be found here. Write the demand letter with a deadline to pay and send it by certified mail. Keep a copy of the letter and the mailing receipt. STEP 3: Complete a Check Offense Report Form. If you do not receive payment within the deadline to pay, complete the Check Offense Report Form. Make sure you include on the Form the name, current address and contact information of the person who accepted the check and can identify the individual that passed the bad check. STEP 4: Send Check Offense Report Form and Documents to DA. You can send the Check Offense Report Form to the District Attorney by e-mail at mail@co7da.org; by U.S. Mail to 1140 N. Grand Ave., Suite 200, Montrose, CO 81401; or drop it off in any of our four (4) office locations. The signed certified card if the letter was accepted. If you do not hear from a District Attorney Investigator within five (5) business days of sending us your Check Offense Report Form, call us at 970-252-4260.